Use this loveseat to update your living space with a casual piece. Sitting on simple block legs, a slightly channeled back for support and plush pillow arms, this loveseat can help create seating for you, your family or your friends as you gather together. Stitching on the front and cushion add detail to the simple piece. Use with a sofa to update an entire living room. 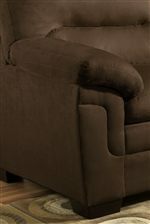 The 3615 Casual Loveseat with Channeled Back and Pillow Top Arms by Simmons Upholstery at Royal Furniture in the Memphis, Nashville, Jackson, Birmingham area. Product availability may vary. Contact us for the most current availability on this product. The 3615 collection gives you casual pieces that are an ideal to update your casual living space. Use a sofa and loveseat combination to update a larger area while the storage ottoman allows you to keep you room neat and organized. Use that bonus storage space in the ottoman to keep blankets or pillows on hand for easy use. Update your living space with the comfortable, casual pieces from the 3615 collection. The 3615 collection is a great option if you are looking for Casual furniture in the Memphis, Nashville, Jackson, Birmingham area. 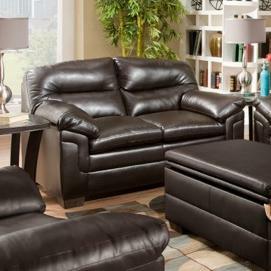 Browse other items in the 3615 collection from Royal Furniture in the Memphis, Nashville, Jackson, Birmingham area.